CLICK HERE TO SEE LIST OF APPROX 3,000 (three thousand) COMPLAINTS ABOUT THE VERASTAR LTD COMPANIES WHICH INCLUDES UNICOM, KINEX, CLEAR BUSINESS, UNIVERSAL DEBT COLLECTION ETC. ETC. 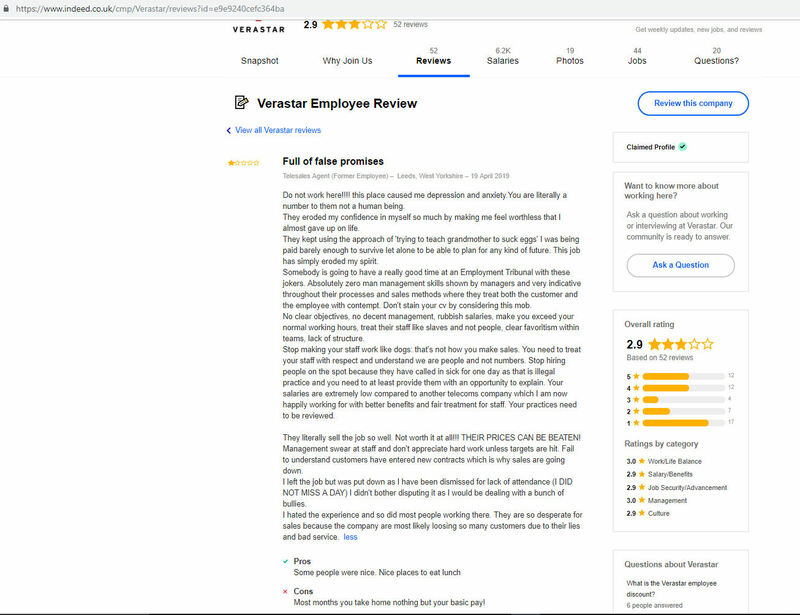 VERASTAR - CUSTOMER REVIEW OF THE WEEK - In which Unicom / Verastar Ltd confirm they have not signed up to Ofcom’s voluntary code of practice which went live in April 2019 to automatically compensate customers when services do not work. Unicom state that as they have not joined Ofcom’s voluntary scheme, they have no regulatory requirement to provide a minimum guaranteed speed. IMPORTANT PLEASE NOTE This web site is NOT owned by Unicom Telecom who changed their name to Verastar Ltd t/a Unicom, Kinex, Clear Business etc in October 2015 a few weeks after Ofcom fined Unicom £200,000 for mis-selling. This web site (unicom-complaints.co.uk) was set up by former Unicom customers to provide information help and support to customers of Verastar, Unicom, Kinex, Titan Telecom, Woav, Clear Business, Universal Debt Collection etc who have followed the company's complaints procedure but failed to find a resolution. Click HERE to hear reports about Unicom on BBC Radio 4 'You & Yours' consumer programme. It may also reassure customers who are disputing termination fees to know that 'Universal Debt Collection' is NOT an external licensed debt collection agency but is simply a part of Verastar themselves. Universal Debt Collection is not licensed to collect debt AS a debt collector. 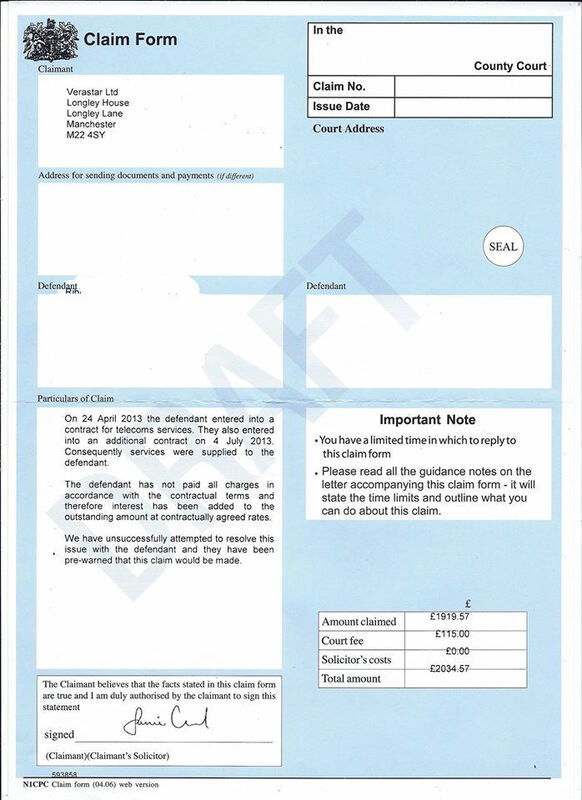 See example of a 'pretend' claim form below. Disclaimer: These are our opinions and not a substitute for legal advice from a solicitor or an organization like Citizens Advice. Complaint about Verastar Ltd t/a Kinex on Trustpilot “PLEASE STAY AWAY FROM THIS COMPANY KINEX” "This bad review about Kinex was taken offline / removed / hidden from view by Trustpilot after Kinex reported the review and claimed that ‘The review contains offensive language that is accusatory / defamatory"
Complaint about Verastar Ltd t/a Clear Business on Trustpilot "What is curious is that the majority of the positive reviews mention by name a member of staff"
Complaint about Verastar Ltd on Google “Talk to me when you pay me the £25,000 you owe me !" Employee complaint about Verastar Ltd t/a Kinex on Trustpilot "Go through staff like there’s no tomorrow"
Employee Complaint about Verastar Ltd t/a Kinex on Glassdoor "Honest review"
Employee Complaint about Verastar Ltd on Glassdoor "Horrendous"
Employee complaint about Verastar Ltd on Indeed "Such a shame"
Employee Complaint about Verastar Ltd t/a Kinex on Indeed "Worst Company to Work with"
Employee Complaint about Verastar Ltd t/a Kinex on Trustpilot "Awful place to work"
Employee complaint about Verastar Ltd on Google "all in all bad place to work"
Complaint about Verastar Ltd t/a Kinex on Google “Constantly being bombarded with calls from desperate sales people with no manners” This review is no longer available. Complaint about Verastar Ltd on Google Dreadful...Dreadful....Dreadful.." 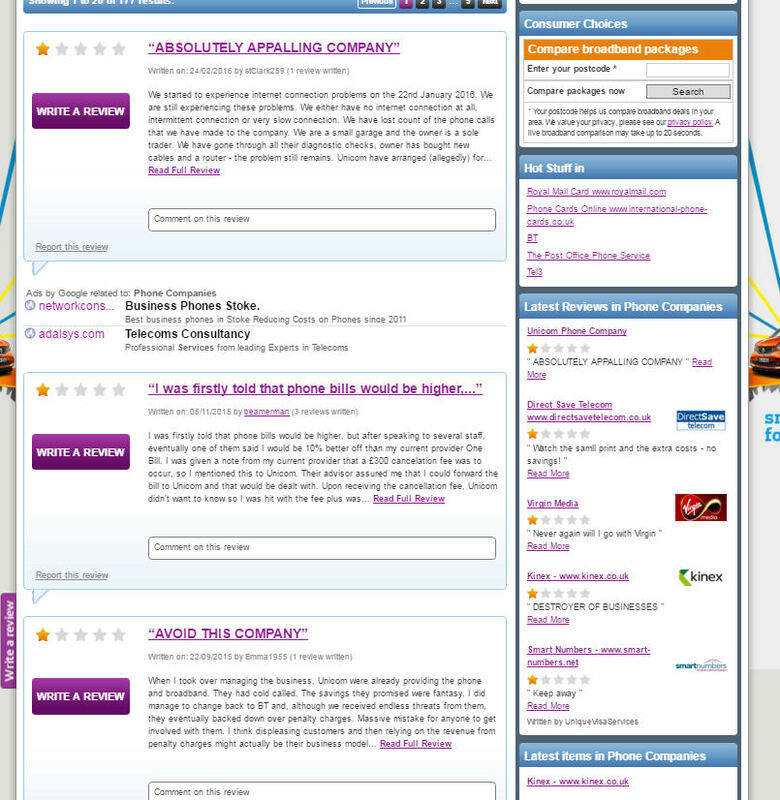 Complaint about Verastar Ltd t/a Kinex on Reviews.co.uk “This company is a disgrace” "PLEASE PLEASE be CAREFUL READ the Reviews"
Click HERE to see further large number of online complaints and postings about Verastar Ltd, Unicom, Kinex, Woav, Titan Telecom, Clear Business etc. etc. Soon after the Ofcom fine of £200,000 for mis-selling, Universal Utilities T/A Unicom registered a change of name at Company House in October 2015 and they are now known as Verastar Ltd T/A Unicom, Kinex, Woav, Titan Telecom, Clear Business Telecom / Energy / Water etc. etc Click HERE to see level of complaints about companies under the Verastar Ltd umbrella. The purpose of this website is to try to bring together people who are having problems with these companies and we also try to provide information that might be useful to customers having problems. We have heard from many people who cancelled their contracts with Verastar / Unicom / Kinex etc for various reasons such as selling or closing down their businesses or because they allegedly were not provided with the services and prices they were promised. Unicom then applied demands for early termination fees amounting to three and four figure sums. 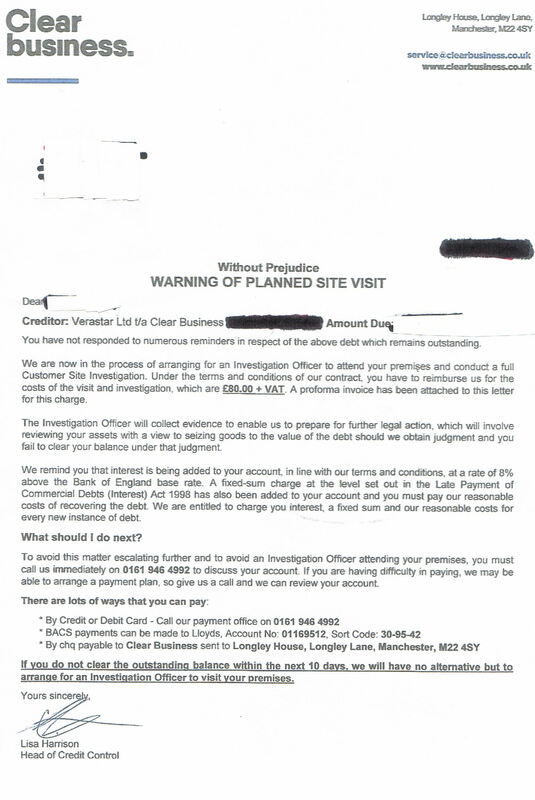 We have heard from many people have felt harassed and intimidated by Unicom's debt collection practices and who have endured months / years of harassing phone calls, multiple letters with threats of legal action if termination fees are not paid by continuously revised dates, threats of involving the bailiffs, threats of trashing the customers credit ratings and state that credit will be difficult to obtain, threats of having to pay court costs, threats of an attachment of earnings order, threats of a charging order on the sale of property, threats of permanent loss of customer’s business telephone numbers, threats of third party debt order to freeze bank account. 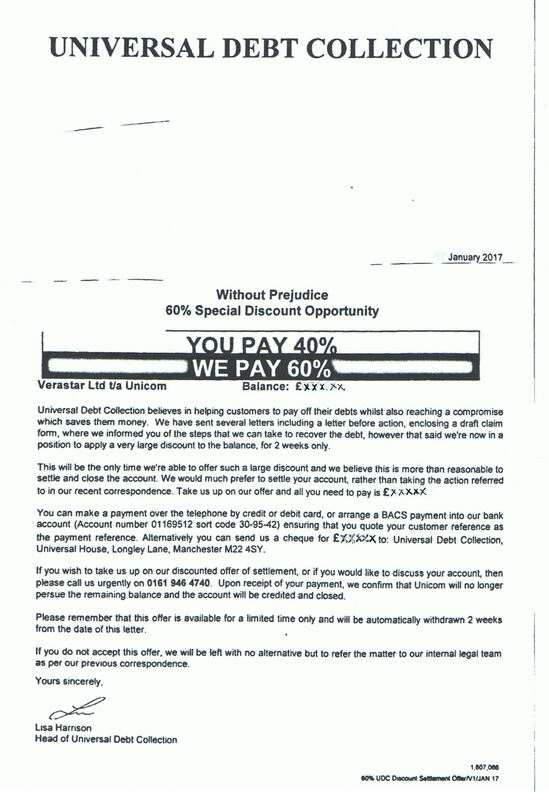 January 2017 We would like to hear from Verastar customers who may have recently received a letter from 'Universal Debt Collection' similar to the letter below. To our knowledge, Unicom have NEVER enforced any of their threats and taken legal action against anyone - ever. We have also heard from a number of former Verastar / Unicom staff who confirmed this information. It would seem that Verastar / Unicom have in the past only ever threatened to take legal action making people's life a misery in the process. It is noted that many negative reviews about Verastar Ltd / Unicom / Kinex / Titan Telecom / Woav etc are deleted from review sites after intervention from Verastar and details can be seen HERE. The number of deleted reviews and postings are listed below and HERE and are highlighted 'Review Removed'. 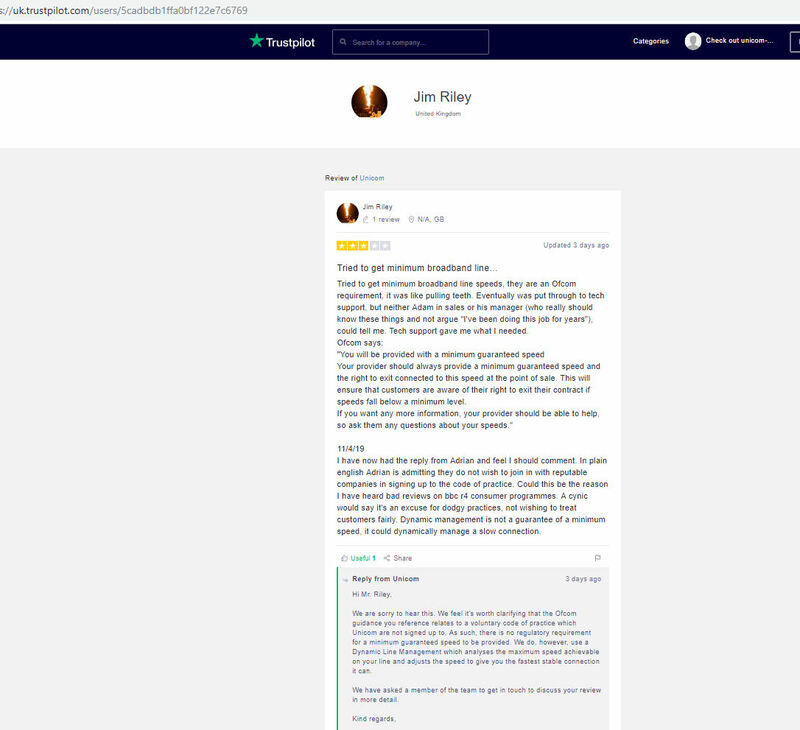 It is noticeable on Trustpilot that most reviewers who posted positive high scoring reviews were 'invited' to do so by the company they are reviewing. However, most reviewers who posted negative low scoring reviews were not 'invited' to do so and posted their reviews under their own initiative. It is also noticeable that the number of negative low scoring Trustpilot reviews are not reflected on Unicom, Kinex and Titan Telecom's own web sites. 23 March 2016. The rating score for Unicom on Trustpilot is 7.9 out of 10 but the rating score on Review Centre is 1.4 out of 5. 9 April 2016 The rating score for Titan Telecom on Trustpilot is 7.9 out of 10 but the rating score on Review Centre is 1.7 out of 5. By comparing the ratings scores of the two review sites, a discrepancy becomes apparent. (It is interesting that Unicom, Titan Telecom and Kinex all subscribe to Trustpilot's paid business service) It is also interesting that Verastar Ltd and Trustpilot are both owned by the same private equity company Vitruvian Partners. Equally interesting is how TRUSTPILOT market their services. ‘DROWN OUT THE BAD PRESS AND POOR REVIEWS OF THE PAST’. 24 July 2017 Review deleted Customer complaint about Kinex on Trustpilot Review deleted Kinex's reason for deleting this review 'We'd like to look into your comments, but we are unable to identify you from your profile and no reference number has been provided. 14 July 2017 Review deleted Customer complaint about Kinex on Trustpilot Review Deleted Kinex's reason for deleting this review 'We'd like to look into your comments, but we are unable to identify you from your profile and no reference number has been provided. 14 July 2017 Review deleted Customer complaint about Kinex on Trustpilot 'when the sales man tells you that it will be a smooth transition and they will do all the work do not believe him,' Kinex's reason for deleting this review 'We'd like to look into your comments, but we are unable to identify you from your profile and no reference number has been provided. 12 July 2017 Review deleted Customer complaint about Titan Telecom on Trustpilot 'Titan Telecom now trading as Clear Business - This company provides terrible service and non-existent customer service.' Titan's reason for deleting this review 'We'd like to look into your comments, but we are unable to identify you from your profile and no reference number has been provided. 10 July 2017 Review deleted Customer complaint about Kinex on Trustpilot 'Very Poor service' Kinex's reason for deleting this review 'We'd like to look into your comments, but we are unable to identify you from your profile and no reference number has been provided. 10 July 2017 Review deleted Customer complaint about Kinex on Trustpilot 'Constant sales calls' Kinex's reason for deleting this review 'We'd like to look into your comments, but we are unable to identify you from your profile and no reference number has been provided. 6 July 2017 Review deleted Customer complaint about Kinex on Trustpilot 'I am about to lose everything I have ever worked for' Kinex's reason for deleting this review 'We'd like to look into your comments, but we are unable to identify you from your profile and no reference number has been provided. 3 July 2017 Review deleted Customer complaint about Kinex on Trustpilot 'Avoid this company!' Kinex's reason for deleting this review 'We'd like to look into your comments, but we are unable to identify you from your profile and no reference number has been provided. 21 June 2017 Review deleted Customer complaint about Titan Telecom on Trustpilot Review deleted Titan's reason for deleting this review 'We'd like to look into your comments, but we are unable to identify you from your profile and no reference number has been provided. 20 June 2017 Review deleted Customer complaint about Titan Telecom on Trustpilot Termination fee of £249? Titan's reason for deleting this review 'We'd like to look into your comments, but we are unable to identify you from your profile and no reference number has been provided. 16 June 2017 Review deleted Customer complaint about Kinex on Trustpilot ‘It's a shame that I still have to give then one STAR.’ Kinex's reason for deleting this review 'We'd like to look into your comments, but we are unable to identify you from your profile and no reference number has been provided. 5 May 2017 Review deleted Customer complaint about Unicom on Trustpilot WARNING WARNING WARNING UNICOM ARE CROOKS PLEASE READ THIS Unicom's reason for deleting this review 'The review is in breach of Trustpilot User Guidelines which state "Your Service Experience with the Company must have occurred within the last 12 months." 31 January 2017 Complaint about Kinex on Trustpilot 'Poor service, hidden charges' Review deleted. Kinex's reason for reporting this review. We'd like to help you with your broadband problems, but we are unable to identify you from your profile and no reference number has been provided. 5 January 2017 Review about Titan Telecom removed from Trustpilot review Site Titan's reason for reporting this review 'You may only write about your own personal Service Experience. You are not permitted to write a review about somebody else's Service Experience, such as that of a family member or friend. 1 Dec 2016 Review about Kinex removed from Trustpilot review Site Kinex's reason for reporting this review 'We are unable to identify you from your profile and no reference number has been provided. 29 Nov 2016 Review about Kinex removed from Trustpilot review Site Kinex's reason for reporting this review 'Your review violates Trustpilot's User Guidelines, V2.1 November 2016, as you have created multiple profiles to review the same Company multiple times. 2 Nov 2016 Review about Unicom removed from Trustpilot review Site Unicom's reason for reporting this review (‘Your review has been reported as it contains language that is accusatory and likely to be viewed as inflammatory, includes defamatory statements, or otherwise violates Trustpilot Guidelines. We have set up a 'support group' where people having problems with Verastar / Unicom / Kinex / Titan Telecom can contact others to share experiences and help and support each other. Please contact us at contact@unicom-complaints.co.uk if you would like details of how to join our group.